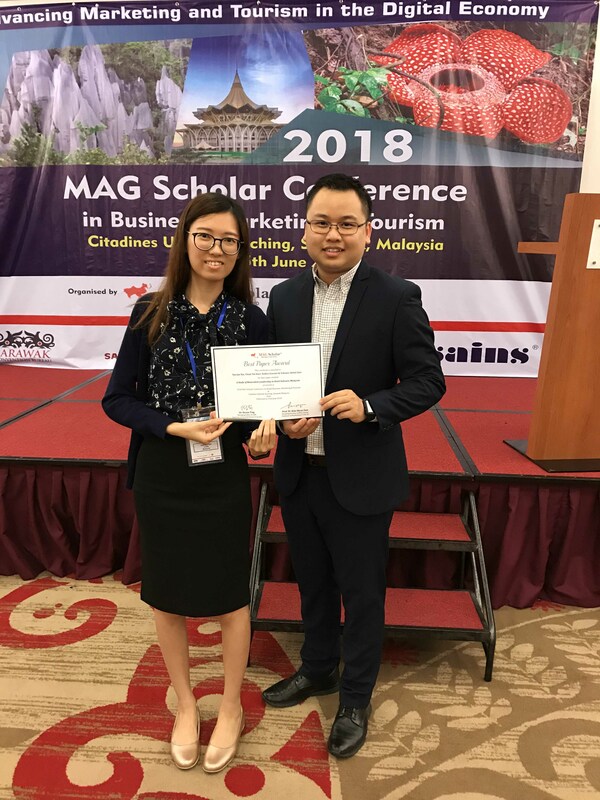 UTAR Faculty of Accountancy and Management (FAM) lecturer Tan Jue Xin and Head of PhD and MPhil Programmes Dr Cham Tat Huei received the “Best Paper Award” in the 2018 MAG Scholar Conference in Business, Marketing & Tourism. The paper was co-authored by Universiti Putra Malaysia Faculty of Economics and Management Deputy Dean Assoc Prof Dr Yuhanis Abdul Aziz and senior lecturer Dr Dahlia Zawawi. The conference was held from 23 to 25 June 2018 at Kuching, Sarawak. The international conference was organised by MAG Scholar and Sarawak Research Society (SRS). 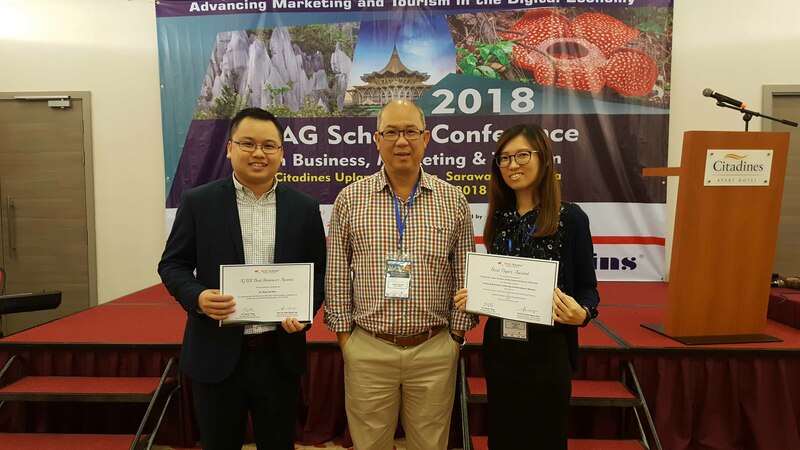 Themed ‘Advancing Marketing and Tourism in the Digital Economy’, the conference aimed to provide a conducive platform to enhance interactive exchange among the academics, researchers and industry players. The conference saw participants from various countries such as Malaysia, Wales, United Kingdom, New Zealand, China, Australia, United States, Hungary, Japan, Zimbabwe, Indonesia, Singapore and Macao. The paper titled, “A Study of Benevolent Leadership in Hotel Industry Malaysia” focused on discussing the long-standing turnover issue in Malaysia’s hotel industry. By recognising the importance of workplace relationship in contributing to the retention of hotel employees, the study found that benevolent leadership, a leadership style that displays holistic concern towards employees’ personal well-being beyond the working context, has a significant impact in retaining hotel employees. “As a novice scholar, it is definitely a big step forward in my research journey. The reward is indeed a huge source of motivation that keeps me going. I appreciate and value the effort contributed by the co-authors. I’m grateful to them for sharing their research experience with me. From this event, I believe that there would be greater research opportunities ahead, waiting for me,” said Tan. At the conference, Dr Cham took home the Asian Journal of Business Research (AJBR) “Best Reviewer Award”. AJBR is an international journal by MAG Scholar with the aims to disseminate new and challenging theories, paradigms, findings and managerial implications based on actual Asian business situations. AJBR has been indexed in the list of Australian Business Deans Council (ABDC), Excellence in Research for Australia (ERA), EBSCOhost, Cabells and was recently accepted into SCOPUS by Elsevier. 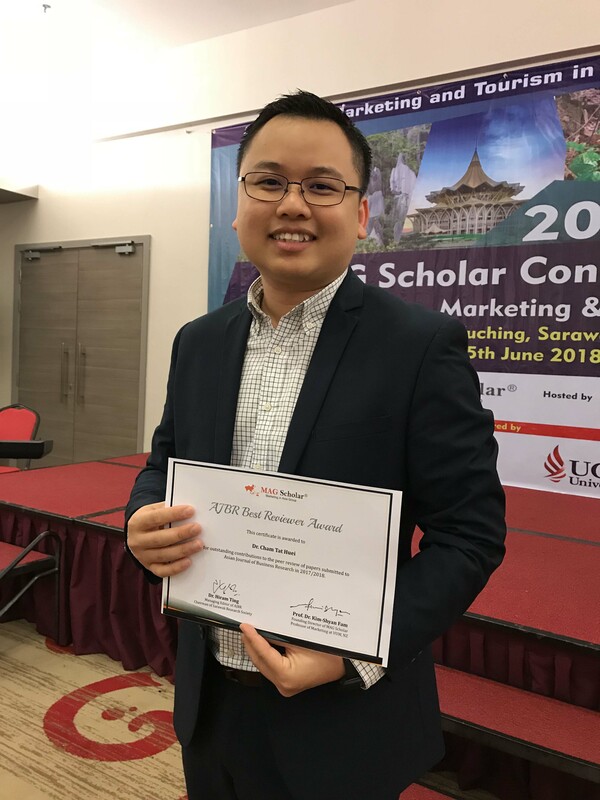 “I do article review for various academic journals, including the International Journal of Pharmaceutical and Healthcare Marketing, Journal of Hospitality Management and Tourism, Tourism Management Perspectives Journal, Asia Pacific Journal of Marketing and Logistics, Management Decision,Asian Academy of Management Journal and VINE: Journal of Information and Knowledge Management Systems,” said Dr Cham.